We will soon be opening our Grow School in the Denver area. Check out our books at MarijuanaBooks.com. 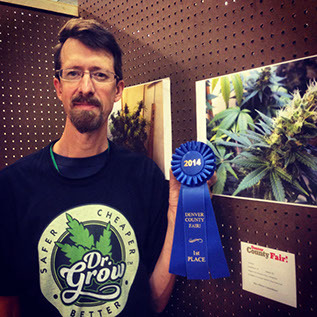 Dr. Grow Won the First Ever County Fair Cannabis Growing Competition at 2014 Denver County Fair! Visit MarijuanaGrowSchool.com for information on our classes. Watch for our upcoming new Internet radio show "Ask Dr. Grow." Here at Doctor Grow, we believe everyone should have access to growing their own food, flowers, and marijuana. It will be less expensive than buying in the stores, and you can choose to grow what you want, rather than settling for what someone else has grown. There are many advantages to growing your own. If you start with good, organic non-GMO seeds, you will know that you are growing REAL food, not "Franken Food." You can decide what chemicals (or not) you will be adding to your crops. With the effects of climate change being felt in California and the Midwest, the extreme weather and drought is reducing crop yields and driving prices up. As the climate continues to change, shortages are a real possibility. If that comes to pass, food prices will continue to climb higher and higher. One sure solution to this is to be able to grow your own food. With the right equipment, you can grow your own vegetables and fruits indoors, all year around. To that end, we are busy engineering and designing indoor grow kits to allow people to grow their own food, flowers and marijuana (where it is allowed by state law) indoors. 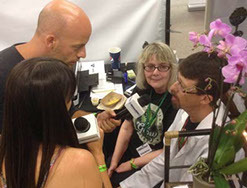 Sirius XM's Reefer Radio was at the History-Making Denver County Fair Pot Pavilion, covering the activities. They interviewed Justin Griswell and Victoria Young Maciulski, the founders of Doctor Grow, LLC. Listen to our interview below. At the Denver County Fair last weekend (August 1-3, 2014), we won the blue ribbon for the best marijuana plant! The Denver County Fair this year made history by having a Pot Pavilion dedicated to marijuana and related items at the fair. They also had a Marijuana Growing Contest. Justin Griswell, one of our founders, entered a plant in the contest. His plant took first place, a blue ribbon for the best marijuana plant! He is shown holding the Blue Ribbon next to photos of the plant. The strain is K-1, a cross between Durban Poison and Sour Kush. "Safer – Cheaper – Better."